6 for $336.00 total Need more quantities? If you would like to enjoy an extended season of red Raspberries for fresh eating, desserts, jam, or freezing, we offer a collection that will do the job. 'Prelude' (PP 11,747) is an early season summer berry that also repeats with a smaller crop of flavorful fruits in the fall. Its sibling, 'Encore' (PP 11,746), ripens in late midseason, producing large berries on sturdy, upright, and nearly spineless plants. Both are hardy and vigorous and come from the Cornell Small Fruit Breeding Program in Geneva, NY. The earliest of the fall everbearing varieties, 'Polana' (PPAF) guarantees a good crop even in northern gardens. It bears in early August here in Connecticut. Our supplier recommends giving 'Polana' extra fertilizer in May and June. Our sampler contains 2 of each variety, 6 plants total. 1-year-old, #1 grade bareroot plants. I followed the directions to the "T". Our climate is a micro-climate where we grow every kind of fruit imaginable (including berries) and the soil is xlnt. Despite all of this, not one of these sprouted. It was very disappointing. I planted this mix 7 years ago while pregnant (hence the easy to plant comment), and we had berries by August, a good harvest the following season. I put in 9 plants, and with minimal fall pruning and light additions of compost, we now have a giant patch of raspberries. The mixture of varieties really does result in nearly continual production of berries. This was one of the best landscaping / gardening purchases I have ever made. We planted these April 15, 2009. We had abundant fruit well through November! And we live in the Northeast! Choosing a site. Plant in full sun and in rich, well-drained soil. Avoid siting where wild brambles, fruit trees, Strawberries, Melons, Tomatoes, Potatoes, Eggplants, or Peppers have been grown in the past. Soils in which these plants have grown may harbor disease-causing organisms. Spacing. Plant blackberries 4-5ft apart in a row, with 10ft between rows. Space Raspberries 3ft apart in a row, with 8ft between rows. Planting. Before planting, remove and discard the packaging materials and soak the roots in a pail of water for several hours. While soaking the roots of Blackberries, keep a towel or large rag wrapped loosely around them to keep moisture in and light out (keeping the roots covered in the bucket until you actually put the plant in the ground). For some reason not clearly understood even by fruit scientists, Blackberry bushes whose roots are exposed to bright sunlight may not survive transplanting. Adding compost, aged manure or a balanced organic fertilizer to your soil as you prepare the site will help plants get established. Dig a hole wide enough to accommodate the roots and deep enough to allow you to set the crown (the point where the stems of the plant meet the roots) 1in below the surface of the surrounding soil. Place the roots in the planting hole and arrange them like the spokes of a wheel or in whatever fashion appears natural, but take care not to break them, for they are fragile. Holding the crown at the proper level with one hand, push the soil back into the hole with the other, working soil around the roots to prevent the formation of air pockets. (Proper planting depth for Raspberries is 1-2in deeper than they were in the nursery. Blackberries should be just a little bit shallower -- ½-to-1in deeper than the soil line on the stem.) Then firm the soil around the crown with your feet. To catch and hold water and channel it down to the roots, make an 18-24in diameter ring of soil around the base of the plant. Finally water thoroughly -- even if rain appears imminent -- to settle the soil. Watering and Fertilizing. Blackberries and Raspberries need at least 1in of water per week, especially during the first season after planting. If the amount of rainfall is less than this, water deeply at the base of the plants once a week. Keep moisture off the leaves to discourage disease. Fertilize the plants 4-6 weeks after planting, with a timed-release fertilizer. In subsequent years, fertilize in early spring and again in early July. Adding 1-2in of compost or well-rotted manure as a side dressing around each plant in spring will improve the soil's texture and add nutrients as well. Training and pruning. To keep your plants healthy and productive and their fruit accessible for picking, it's a good idea to trellis them. 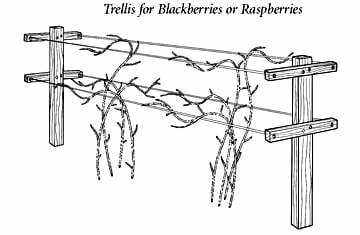 A simple pair of T-shaped trellises, each consisting of a post and crosspiece with wires connecting them works well for Raspberries. Adding a second crosspiece and using taller posts will accommodate the more vigorous growth of Blackberries. Use a rot-resistant wood such as Cedar or Redwood for the posts. Nail or screw the lower crosspieces 3ft above the ground, and the upper ones 5ft above the ground. No pruning is required the first year as the plants are becoming established. Pruning requirements in the second and subsequent year differ by variety: Blackberries and Summer-bearing Raspberries ('Chester', 'Lauren', 'Nova', 'Triple Crown) -- Second year: prune out fruit-bearing canes soon after harvest. Third year and thereafter: in late winter before growth resumes, thin to leave 5-7 strong, healthy sideways-growing canes per foot of row (the canes growing sideways from the main stems are the fruit-bearing canes). Continue to prune out old fruit-bearing canes after harvest. For best results, contain the planting bed to a 12 ft width. Everbearing Raspberries ('Autumn Britten')--two methods can be used: 1) for a continuous crop of fruit, prune as described above for summer-bearing raspberries; 2) for a more plentiful fall crop, treat everbearers as fall-bearing to restrict their summer crop. To do so, cut or mow down all canes each year, after all leaves have fallen in late fall or in late winter just before new growth begins. Cut canes as close to the soil as possible to encourage the growth of new suckersthat will produce heavily in fall. Harvesting. Our Raspberries and Blackberries begin bearing the second year from planting. The fruits are ready to pick when they pull easily off the cane. For information on growing Bushel and Berry™ Raspberries click Growing Bushel and Berry® Blackberries and Raspberries.